We know that in 1535 Angela chose the feast of Saint Catherine, November 25, to mark the official foundation of her Company. She chose Saint Ursula as patroness and gathered her daughters. Together they assisted at Mass. Then in turn, each signed her name in the ‘Book of the Company’, a commitment which was the equivalent to a solemn promise of fidelity; and so with the minimum of ceremonial the first members of the Company of Saint Ursula gave themselves to God: the Company was formed. The fact that Angela had chosen November 25 for the foundation day had a clear meaning for her followers. 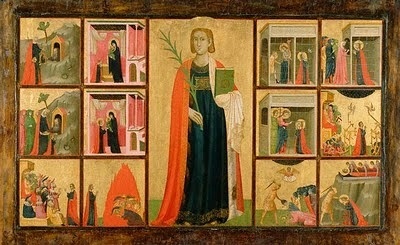 Saint Catherine was a consecrated virgin of the primitive church and a saint to whom the Divine Child had given the ring of mystic espousal. The Madre, as Angela was called, always looked on her daughters as spouses of Christ; the very expression occurs again and again in her writings. In today’s language we might speak of people for whom the search for God is central and all absorbing! Saint Catherine lived at the beginning of the fourth century, in the time of Emperor Maxentius. Of royal blood she was a lady of stunning beauty, considerable wealth and of first rate education. She sought counsel from a wise and saintly ascetic Christian and was converted to the faith. On the night of her baptism, she dreamt of Mary and the Christ Child. Christ said: ‘She is now worthy and I accept her as my bride.’ Christ then placed a ring on her hand, saying, ‘Today I take thee as my bride, for all eternity’ – a kind of confirmation experience of her daring life choice. 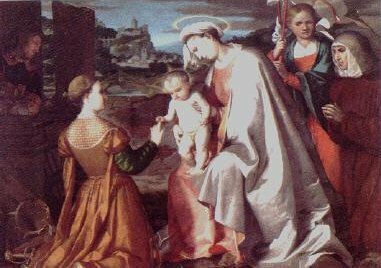 On the right hand side of this painting of the mystical marriage of Saint Catherine you can see Saint Ursula, standing, and Saint Angela, kneeling. We believe that this is probably the best likeness of Angela as it was painted in 1538, while she was still alive. Today we, the followers of Angela, try, like her, to tune into to the movements and wisdom sources of our time so that we may interpret the work of God and the Gospels anew.